Preschool^-Gr.1. A little girl tries to entice three feisty cats into becoming her playmates in a preprimer that tackles basic vocabulary. The story is sweet and very simple, with the text ensuring reading success by using fundamental vocabulary words (I, see, run, cat, play, come, etc.) over and over again. The double-page spread watercolors have a light, unrestrained feel, well suited to the exuberance of a child at play. Stephanie Zvirin --This text refers to an out of print or unavailable edition of this title. A book that is a pleasure to read once and again--Buck (Sid and Sam, p. 65, etc.) scores with this entry in the My First I Can Read Book series. With a careful economy of words, Buck tells of a hopeful relationship between a girl and three cats. Using primarily four- word sentences and monosyllabic words, as well as internal rhyme for the sound of poetry, a girl urges cats to frolic with her. She tries to get them to swing, play hide-and-seek, and come down from a tree: ``If you stay, cats/we will play, cats. Up to you, cats./Be my new cats.'' Just when it seems the cats will run away, they all land together at her feet, in a cuddly heap. Fewer than 100 words faithfully employ repetition, yet also impart personality to the girl and the shy cats. The illustrations are full of mild humor and just the right amount of action, providing helpful clues for those deciphering the words. It can't be easy to make so few words add up to so much fun, but Buck and Westcott have done it. (Picture book. 5-8) -- Copyright ?1996, Kirkus Associates, LP. All rights reserved. --This text refers to an out of print or unavailable edition of this title. When a young girl spies three cats in her yard, she hopes they will be her playmates! But these frolicking felines have other ideas for fun. Will they ever be her friends? 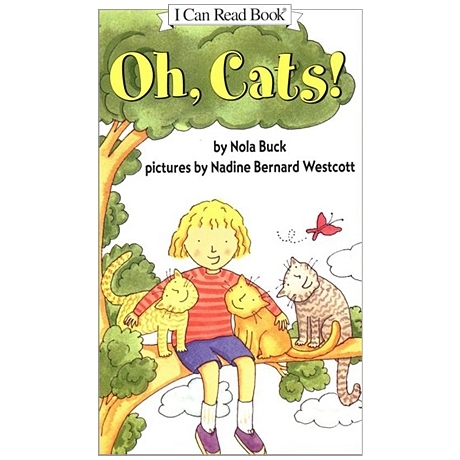 Illustrated with bright, fresh pictures by Nadine Bernard Westcott, Nola Buck's simple text is perfect for emergent readers and cat lovers alike.